Supercalifragilisticexpialidocious. You recognise this lady of course! I read many of the Mary Poppins books not just the original with the Banks family and enjoyed the movie as well. As a child I had Mary Poppins, Bert, Jane and Michael paper dolls, actually I still have them in the doll box with all their outfits. This card was fairly straight forward to make. I brayered the sky with pink and yellow from one end of the panel and dark blue from the other. I dotted the sky with a gel pen then stamped outline stamps along the bottom and coloured them in with a black sharpie to change them to silhouettes. 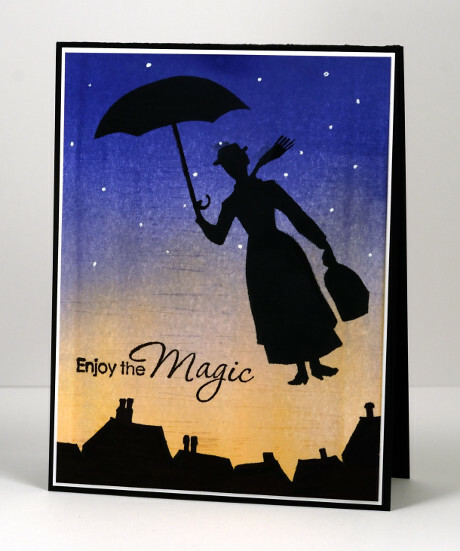 I made a stencil of Mary Poppins by printing her picture then cutting her out with a craft knife. Then I sponged through the stencil with black and added a sentiment. Yesterday a few of you added your favourite imaginative or magical stories in the comments. Winnie the Pooh got a mention as did Harry Potter and Mother Goose. I have one more left to share and it is a huge favourite of mine and has been read or listened to numerous times in our family. It is definitely a classic. Heather, I’ve really loved your storybook series. Just wonderful! Love this! You make us all smile. Thanks Heather! Oh my Heather, you are so creative. Another beauty. Wonderful – I think we all love Mary Poppins! I really enjoyed your stamping the stories series. I would love to see more! You are very creative and I love how you were able to incorporate your love for these stories into beautiful cards!